Optoelectronics Research Group, high speed optical communications, photonic crystals at optical and microwave frequencies, the milli-Volt switch, optical antennas and solar cells. Eli Yablonovitch introduced the idea that strained semiconductor lasers could have superior performance due to reduced valence band (hole) effective mass. With almost every human interaction with the internet, optical telecommunication occurs by strained semiconductor lasers. He is regarded as a Father of the Photonic BandGap concept, and he coined the term "Photonic Crystal". The geometrical structure of the first experimentally realized Photonic bandgap, is sometimes called “Yablonovite”. In his photovoltaic research, Yablonovitch introduced the 4(n squared) (“Yablonovitch Limit”) light-trapping factor that is in worldwide use, for almost all commercial solar panels. His mantra that "a great solar cell also needs to be a great LED”, is the basis of the world record solar cells: single-junction 29.1% efficiency; dual-junction 31.5%; quadruple-junction 38.8% efficiency; all at 1 sun. His startup company Ethertronics Inc., shipped over 2 billion cellphone antennas. He co-Founded Luxtera Inc., the originator and world leader of Silicon Photonics, now acquired by Cisco Systems. There is a 2-dimensional Photonic Crystal, in every Luxtera Silicon Photonics chip, millions of which are in major data centers, used by billions all around the globe. 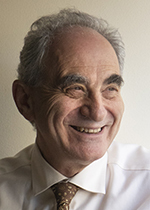 Prof. Yablonovitch is elected as a Member of the National Academy of Engineering, the National Academy of Sciences, the National Academy of Inventors, the American Academy of Arts & Sciences, and is a Foreign Member of the Royal Society of London. He has been awarded the OSA Ives-Quinn Medal, the Benjamin Franklin Medal, the IEEE Edison Medal, the Isaac Newton Medal of the UK Institute of Physics, the Buckley Prize of the American Physical Society, the IEEE W.R. Cherry solar cell award, the Rank Prize (UK), the Harvey Prize (Israel), the IEEE Photonics Award, the IET Mountbatten Medal (UK), the Julius Springer Prize (Germany), the R.W. Wood Prize, the W. Streifer Scientific Achievement Award, and the Adolf Lomb Medal. He also has an honorary Ph.D. from the Royal Institute of Technology, Stockholm, the Hong Kong Univ. of Science & Technology, & McGill Univ., and is honorary Professor at Nanjing University. E. Yablonovitch, O. Miller, and S. Kurtz, "Strong Internal and External Luminescence as Solar Cells Approach the Shockley–Queisser Limit," IEEE Journal of Photovoltaics, vol. 2, no. 3, pp. 303-311, July 2012. M. Staffaroni, J. Conway, S. Vedantam, J. Tang, and E. Yablonovitch, "“Circuit Analysis in Metal-Optics”,," Photonics and Nanostructures, vol. 10, no. 1, pp. 166–176, Jan. 2012. E. Yablonovitch, "Photonic Crystals: Semiconductors of Light," Scientific American, vol. 285, no. 6, pp. 47-55, Dec. 2001.